I have always been terrible at the game of chess. It's not that I don't understand how the game is played--I perfectly understand the rules and moves. The problem is my inability think ahead. If I make a move on the board that seems to be prudent, three moves later, it usually turns out to have been a fatal mistake. When I play against a computer, I normally get beat like a rented mule. The only way I've been able to win at the game is by cheating. I have one program that allows me to turn one of my pawns into an extra queen. Sadly, even with this unfair advantage, the devilish program still finds a way to overcome the shortfall and checkmate me. Chess is often depicted as a sport for wimps, but this label is incorrect. A son once asked his dad why chess is not an Olympic game. His father’s response was brief and to the point: "Chess is not a noble sport. When you play chess, your object is to crush the opponent's mind. In today's world, a man's mind is his most precious commodity. Proving to your opponent that his most precious commodity is useless can be devastating for him." It is anyone’s guess what Satan does for recreation in his spare time, but I imagine he would be very good at chess. For someone who spends most of his time devising strategies for ensnaring humanity with various vices, he would likely be a formidable chess opponent. One of the greatest mistakes we can make is to underestimate Satan’s cunning. We tend to view him as a loser who ran afoul of God and got fired from his job. Unfortunately, he found new employment: the task of damning men's souls to hell. A wise person is someone who realizes it is impossible to match wits with the devil. Just as I would have no chance of winning a game of chess against the world's most powerful computer, Satan can outmaneuver me with hardly any effort. A good example of this can be found in the waning days of World War II. As Germany was losing the war, many Germans realized Adolf Hitler was a mad man who needed to be stopped by any means. At least 42 attempts were made to take his life, and all failed in preposterously inconvenient ways. An Iron Cross recipient at	Nuremberg was going to stab Hitler in front of 1,000 soldiers at an assembly. Hitler had a cold that day and decided to go home early. A bomb that was intended to blow up the Nazi leader in mid-flight failed to go off because cold weather had hindered the reaction of the chemicals in the bomb. An infantry captain made plans to explode a bomb while he demonstrated a new army winter overcoat to the German leader. The day before the bombing was to take place, a British air raid destroyed the uniforms. One general tried to kill Hitler with a concealed bomb that was to be detonated by acid. Unfortunately, Hitler left the building before the acid could act. A bomb finally did go off next to Hitler. The Fuehrer was spared by a heavy desk that shielded him from the blast. Historians actually joke that Hitler had “Satan's luck.” The truth is, the devil's hand was as work, and the opposition was pursuing an impossible quest. Perhaps if the Nazi leaders had prayed for “God's luck,” they might have accomplished their goal and saved millions of lives. Most professional chess players have a series of favorite ploys they like to use against their opponents. Satan has several tricks he regularly uses against us. By being aware of them, we can avoid his snares. Paul said, "Lest Satan should get an advantage of us: for we are not ignorant of his devices" (2 Cor. 2:11). Here are six of the strategies that Satan uses. Because they all begin with letter "D," they should be easy to remember. Divide - A standard strategy is to divide the enemy force in order to make it easier to conquer. Satan loves to create division so he can pick off the weak and weak-minded people. Doubt - The Bible says, "Without faith it is impossible to please God." Once Satan can persuade people to question God's Word and His goodness, forgiveness, and love, he is ensured of victory. Discourage - This strategy involves getting us to focus on our problems rather than entrusting God to provide a solution. It can also be someone else’s problem that creates discouragement in our own lives. Diversion - Not all problems are equal. The enemy may come at us with an attack of lesser importance to distract us from his main attack. He may also distract us with good things. For example, parents may become too focused on their careers, enabling their children fall into rebellion. Defeat - The devil is at his best when he causes people to feel so overwhelmed by failure that they don't even try to resist his onslaught. If we’re not resisting the devil, he will move in for the kill. Delay - In the game of life, Satan wins by default. We are all born in a lost state, so unless we come to faith in Jesus Christ, we will perish. Because procrastination doesn't require doing anything, this strategy is an easy path for victory. 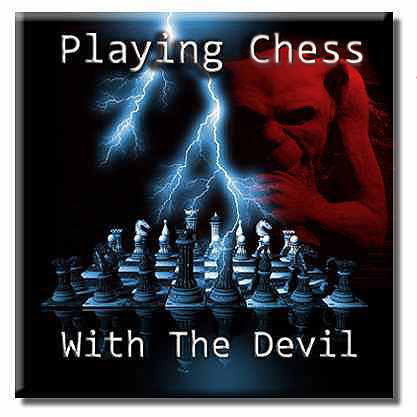 The rivalry between God and Satan is often seen as a battle between two equally skilled chess masters, playing against one another to see whose plan will be victorious. This vision is totally fictitious. There never was a real contest between God and Satan, and there never will be. God is in charge of everything that happens. His level of control is so absolute, He sets the stage for everything that will happen in the universe. How can Satan compete against a Being who knows every move he is going to make ahead of time? God does more than just rule the chess board. He controls both the white and the black pieces. The devil is so hopelessly outwitted, God published in the Bible many of Satan’s fatal mistakes far ahead of the time he made them. There are still some blunders yet to come. The Holy Word predicts that the devil will attempt to destroy the Jews and that he will make a stand against Jesus at the Battle of Armageddon. Both will end in total failure. With God having proven himself unbeatable, one might wonder why Satan keeps challenging Him. The devil's problem is that he has such a depraved, arrogant mind, he is incapable of admitting defeat. There is no limit to the foolishness of a heart that is in rebellion against God. For this reason, Satan still thinks he has a chance to vanquish the Almighty. The only reason we have the impression that God is in a fair contest with His adversary is the fact He grants His creation free will. Our decision to accept or reject God has no reflection on Him. We can make all the decisions we want, but in the end, they all fit into God's perfect plan. One of the clearest indications of how vulnerable we are to Satan's willpower can be found in the warning Jesus gave Peter in Luke 22:31: "Simon, Simon, Satan has asked to sift you as wheat." At first, I thought this verse meant that Satan had asked for dominion over Peter and Jesus rebuffed the request. Jesus then said, "I have prayed for you, Simon, that your faith may not fail..." (Luke 22:31). But I didn't pay attention to the last part. Jesus added "...And when you have turned back, strengthen your brothers," which means that God had allowed Satan to sift Peter. Peter was the type of emotional person that made him easy pickings for the devil. In the space of one night, he rebuked Jesus when He told the disciple of His pending death, he turned to violence by cutting off the ear of the High Priest's servant, and he denied the Lord three times. Peter met with failure because he was out of God's will. He trusted in his own strength, and Satan made mincemeat of him. When Peter realized his mistake and became totally dependent on God's guidance for his life, he then became a victorious leader of the Church. I have been whipped by the devil several times because I failed to seek God's counsel on important issues. What has saved me from complete disaster is the belief that Jesus is Lord of life. Giving God credit didn't save me from having to seek His guidance on how to untangle problems that I allowed to come my way. We generally fail to take our daily matters to prayer because we don't think it’s that important, we’re too lazy, or we just don’t think God will answer us. Because we live in an evil world with an enemy who drools at the thought of being able to destroy the lives of Christians, we can't afford to not seek God's direction. I will end with these words of advice. Jesus Christ is our Eternal King, and He is Invincible--the ultimate Checkmate Master of this chess match of life in which we are engaged. If we put our trust in the Lord, He will lead us to victory. "But thanks be to God, which giveth us the victory through our Lord Jesus Christ" (1 Cor. 15:57).